When Stephen Harper comes to town, it rarely goes unnoticed. About 100 protesters rallied peacefully on Friday outside the Palais des congrès, where the prime minister addressed the Board of Trade of Metropolitan Montreal in an over-$1,000-a-table meeting about the recent agreement-in-principle on a Canada-European Union trade deal. 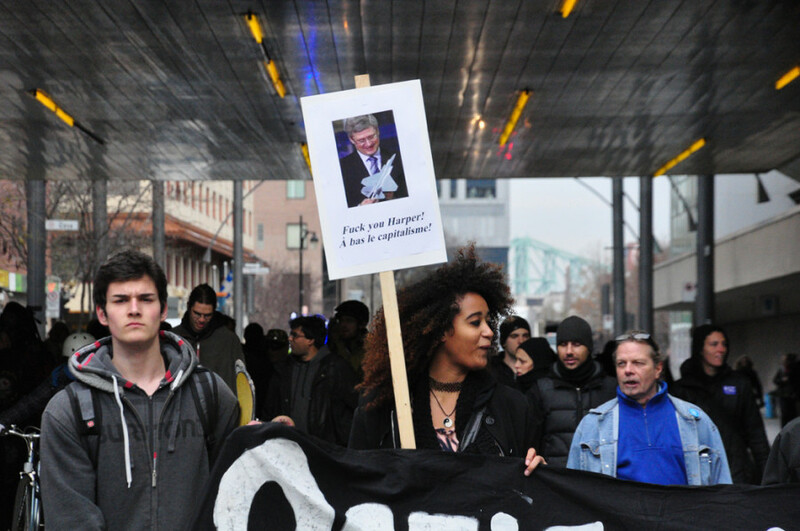 “There are an overwhelming number of reasons to be opposing Stephen Harper,” said Jaggi Singh of Concordia’s chapter of the Quebec Public Interest Research Group, which organized the protest. The protesters also condemned cutbacks to employment insurance as well as other austerity measures, such as the government’s support for tar sands, pipeline and mining projects, and the alleged use of torture in the war in Afghanistan. The protest was one of three similar ones held the same day across the city. 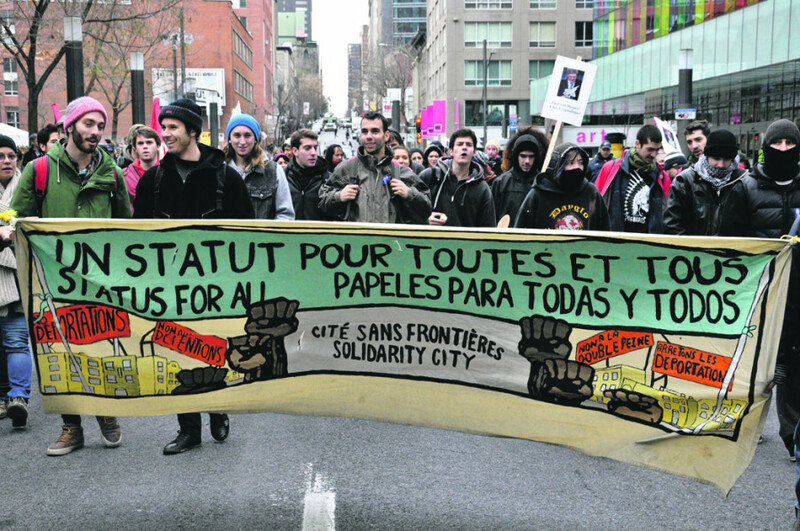 Outside the Mont-Royal metro station, the Association pour une solidarité syndicale étudiante, one of the largest student federations in Quebec, organized its own protest against austerity policies. Across town, the Fédération des travailleurs et travailleuses du Québec were rallying against cuts to EI. The march outside the Palais des congrès did not end with any arrests or other serious incidents. Although police quickly declared the protest to be in violation of municipal bylaw P-6, which bans the wearing of masks during protests and requires that organizers submit an itinerary to police ahead of a protest, the demonstration was allowed to continue. 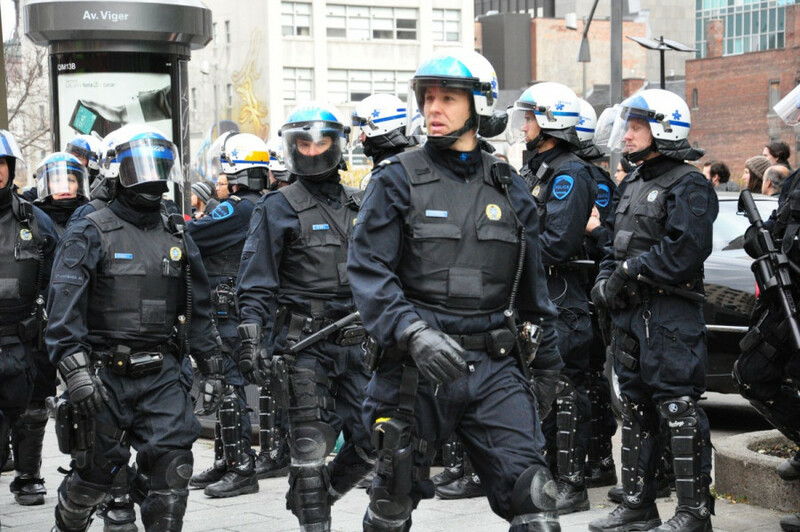 The protesters circled the Palais des congrès twice with police blocking off the building’s entrances. “If anything, the police presence is heightening tensions,” Singh said early on. Tensions remained low at the protest, however, even as riot police made their appearance. As the officers filed in front of the building’s main doors, the crowd broke out into “The Imperial March,” Darth Vader’s foreboding theme song in the Star Wars film series. Even a few “stormtroopers” couldn’t help but crack a smile. Although the turnout for the protest was relatively small, Singh underlined its importance. “The people in power have a way of tuning out these kinds of protests, but these are the kinds of protests that provide the basis for larger movements,” he said.